This take on the classic "impossible triangle" or "Penrose triangle" illusion uses dice to create the appearance of an object that is fundamentally impossible in ordinary Euclidean space. 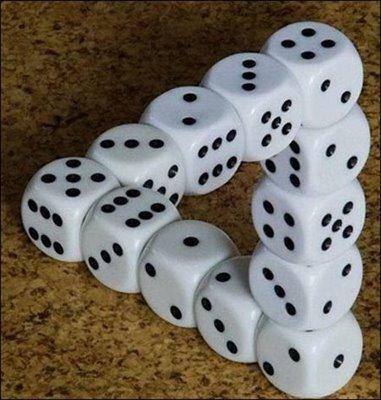 all thispicture is is dice that are photoshopped so really its no illusion its just really good art work on the computer. Lol weird. I don't really like things like this yet it's soooo cool!!!! This is not photoshopped. It is actually a Z sort of shape that has been taken a picture of from a specific angle. I tried it at home and it works. I did it with lego though.